On Friday, March 16, Isber Sabrine from Heritage for Peace gave a talk at the International University of Peace in Barcelona under the title “Cultural heritage as a tool for peace. In this talk he presented the work of the NGO on the protection of Syria’s cultural heritage and how the NGO used Syria’s cultural heritage as a tool for peace building and dialogue in the Syrian conflict. See details here. 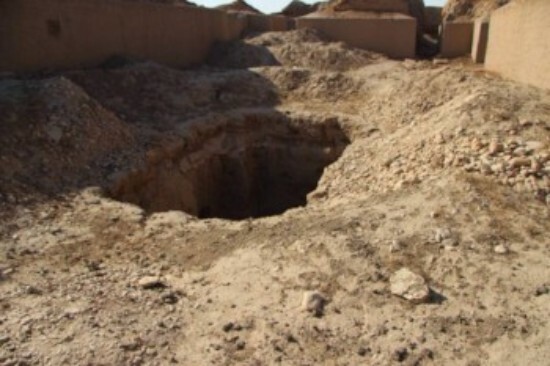 Members of the Directorate conducted a preliminary assessment of the damage to the archaeological site of Mari. Here are new photos of the damage. The DGAM report damage to the site Brad / Barad, one of the Villages in the World Heritage Ancient Villages of Northern Syria. The report is available here. Photos have also been shared by the Idlib Museum here, and a video is available here. A video by Al-Jazeera shows the situation at the site of al Nabi Houri, dated to 26 February 2018: it shows no destruction at the Site. See it here. The research by Neil Brodie and Isber Sabrine “The Illegal Excavation and Trade of Syrian Cultural Objects” is now available free to download from the Journal of Field Archaeology here. A paper by Katie Paul “Ancient Artifacts vs. Digital Artifacts: New Tools for Unmasking the Sale of Illicit Antiquities on the Dark Web” is free to download from Special Issue Advances in Art Crime Research here. In an official complaint filed with the UN Security Council, Syria has accused Turkish and Israeli intelligence services of stealing ancient artifacts from a historic synagogue in Damascus. See more information here. Spanish police are holding two men suspected of trading in antiquities looted by groups linked to Islamic State, the first publicly announced detentions by Western authorities working to dismantle the terrorist group’s trade in plundered art. Read more in the Wall Street Journal here. Experts from the HTW Berlin Cultural Heritage Programme offered a 5-day training course on preventive conservation techniques for Syrian conservators and curators at the UNESCO Field Office Beirut. The course, which was funded by Gerda Henkel Stiftung, focused on documentation, monitoring as well as packing / transport / storage methods. Lectures were combined with hands-on demonstrations and case studies. The 12 participants are all in charge of safeguarding heritage collections, which had to be packed and evacuated hastily. The course aimed to help Syrian colleagues to minimize risks, and reduce harmful storage situations for the time being. See more information here. A memorandum of understanding was signed in Moscow between the Directorate General of Antiquities and Museums and the Foundation for the Protection of the Cultural Heritage “Palmyra”. It aims at providing the necessary support in the field of restoration and rehabilitation of Syrian archaeological sites and cultural property in the framework permitted by the laws and regulations of the two countries by providing the financial, technical and scientific assistance required for the rehabilitation of these properties, especially the city of Palmyra. Read more here. The Syrian Heritage Archive has been nominated for the 2018 Museums and Heritage Award. Read more on Facebook here. Russia, Iran and Turkey issued a joint statement on Syria following the meeting in Astana on March 16. The statement emphasised the need for further humanitarian aid to Syria and improved preservation for historical heritage sites. Read more on the EurAsia Daily website here. The upcoming Malta World Music Festival with include music by “Refugees for Refugees,” a band that draws on the musical heritage of Syria among other countries. See more here. Syrian refugees are preserving Syrian cultural heritage at a restaurant in New York. Read more here. The Syrian Days Festival in France will take place until the end of April. Events include educational and cultural awareness activities, lectures and a documentary film titled “The Legend of Syria.” See more here. Horizon Magazine wrote here about how people can inadvertently destroy cultural heritage for a second time when cleaning up conflict sites after a war ends. The Art Newspaper reported here about the World Monument Fund’s new centre to train refugees in stonemasonry skills in order to conserve Syria’s monumental heritage. TBO here explored the history of several ancient mosaics, originally from the ancient city of Antioch on the border of modern-day Turkey and Syria, buried on the lawn of the Museum of Fine Arts, St. Petersburg. SF Gate here published pictures of Aleppo before and after damage. The Antiquities Coalition here wrote an overview of the legitimate and illicit art markets, and the difficulty of separating the two when it comes to the sale and purchase of antiquities. Enab Baladi reported here about Raqqa’s history and current conditions. The Daily Nation wrote here about the importance of art and heritage for cultivating tolerance and peace, using Syria as an example of cultural destruction. The Australian Strategic Policy Institute reported here about the dilemmas of post-conflict reconstruction, including issues of reconstruction, funding, organization and community involvement. The Syria Times reported damage to a number of archaeological sites in Deir Ezzor, including the Mari site in Tal Hariri here.